Paris(/PTI/ANI/AFP/web team): Prime Minister Narendra Modi on Saturday visited the Airbus A 380 assembly line facility soon after arriving in Toulouse. Toulouse is the home as well for the Airbus’ A380 final assembly line – a massive facility that provides a space of 150,000 square metres for the flagship double-deck jetliner. Expressing support to 'Make in India' initiative, aircraft manufacturer Airbus said it is ready to manufacture in India, as Prime Minister Narendra Modi visited its facility. 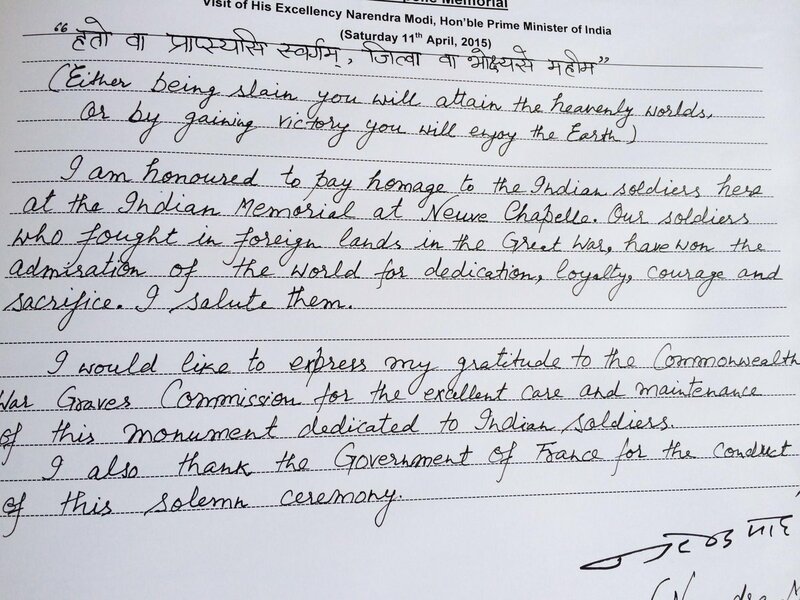 "Hat ova trapasya swargam jitva wa boshaktya mahim", writes PM Modi message in the visitors' book at Neuve Chappelle Memorial. Prime Minister Modi arrives at World War I memorial in Germany to pay homage to the Indian soldiers who lost their lives in the war. PM Modi visits French space centre CNES or the National Centre for Space Studies. PM Modi in Toulouse to see the Airbus facility and discuss ways of further cooperation, including in transfer of technology and investments. The Prime Minister is at the CNES in Toulouse. The A380 assembly process takes place on a single combined station (a section of the assembly line dedicated to performing a specific task) where all operations except for engine installation are carried out. Representing over one third of an aircraft’s value, engines are among the last components to be fitted to the A380 in order to reduce inventory cost. Modi took the tour of the facility where planes are manufactured. He was given a briefing by officials on the functioning. Amazing visit to @Airbus Facility. They are very enthusiastic about @makeinindia initiative. Amazing visit to Airbus Facility. They are very enthusiastic about makeinindia initiative, tweets Modi. PM Modi welcomed at the Airbus facility. PM @narendramodi being welcomed at the @Airbus facility. PM Modi leaves for Toulouse, where he will visit the Airbus Facility. India will buy 36 Rafale fighter jets in flyaway condition from France "as soon as possible" after Prime Minister Narendra Modi and French President Francois Hollande on Friday night agreed to conclude an Inter-Governmental Agreement bypassing the protracted negotiations for purchase of 126 such jets. Some pictures from the @UNESCO programme. Prime Minister Narendra Modi has thanked French President Francois Hollande for the boat ride along the Seine river which has been dubbed as the “nav pe charcha” (tete-a-tete on boat). The Prime Minister, who is presently in France on an official visit, took to Twitter to convey the message. “Thank you President @fhollande for the boat ride on the Seine,” he tweeted. French Foreign Minister Laurent Fabius and senior French government officials were also present on the cruise along with Prime Minister Modi and the French President. Glimpses from today's ceremonial welcome in Paris. France announced an investment of 2 billion euros (about USD 1 billion) in India as Prime Minister Narendra Modi invited French companies to pump in money in technology in the fastest growing economy. 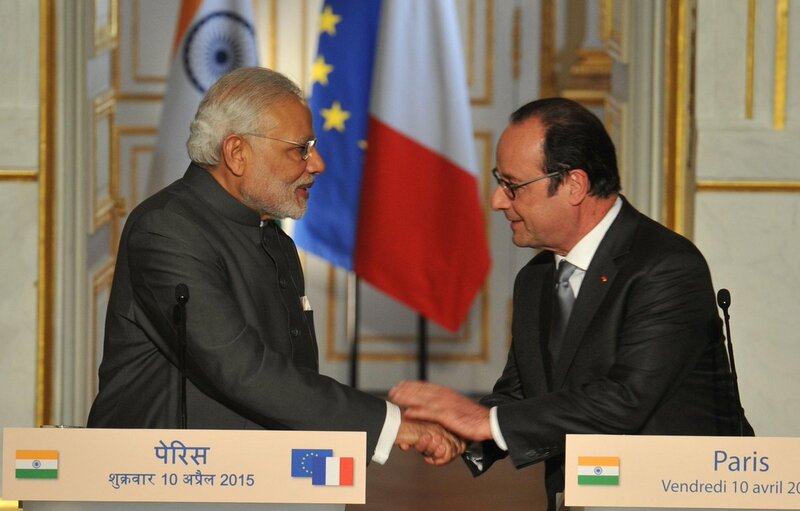 France will invest 2 billion euros in India, President Francois Hollande announced at a CEO forum here. France and India on Friday signed a Memorandum of Understanding (MoU), seeking to strengthen the bilateral cooperation between the two nations in the space sector. Indian Space Research Organisation (ISRO) and French National Centre for Space Studies (CNES) on Megha Tropiques signed an MoU to extend the joint project for sharing and use of data from the satellite for two more years. The Indo-French Megha Tropiques satellite was launched on board the Indian launch vehicle, PSLV on October 12, 2011. ISRO, CNES and Office National d'Etudes et de Recherches Aérospatiales (ONERA) signed an MoU for Ka-band propagation experiment over Indian tropical region. Prime Minister Narendra Modi promised to facilitate Electronic System for Travel Authorization (ESTA) for French citizens travelling to India. “We will also cooperate in modernization of Indian Railways. I'm glad to announce that we will facilitate Electronic System for Travel Authorization for French citizens travelling to India. I'm also grateful to France for their support for India's permanent membership of UN Security Council,” said Prime Minister Modi. “This is my first visit to Europe; this visit indicates our deep and close relationship with France. We are two democratic countries with same values and principles. President Hollande has extended full cooperation in our 'Make In India' campaign in defence sector which is not just a programme, but an ambition,” he said. French President François Hollande on Friday said both France and India are working together to ensure stability and an environment of peace and added that the country was looking forward to the latter becoming a permanent member of the UN Security Council. “France and India are working together in order to ensure stability and an environment of peace. We have numerous joint projects in field of missiles, submarines as well as aircrafts. France supports India so that this very big country becomes a permanent member of UN Security Council,” said Hollande. Prime Minister Narendra Modi and French President Francois Hollande enjoyed a joint boat cruise on La Seine river here which was described as "Naav Pe Charcha" (chat on the boat). Hollande was seen giving details to Modi about various areas as the boat cruised through the river. Many people enjoying a boat ride in the river at that time were seen waving at the dignitaries, including French ministers. The two leaders had the boat ride after their detailed discussions, focusing on cooperation in the areas of civil nuclear energy, defence, space and trade. 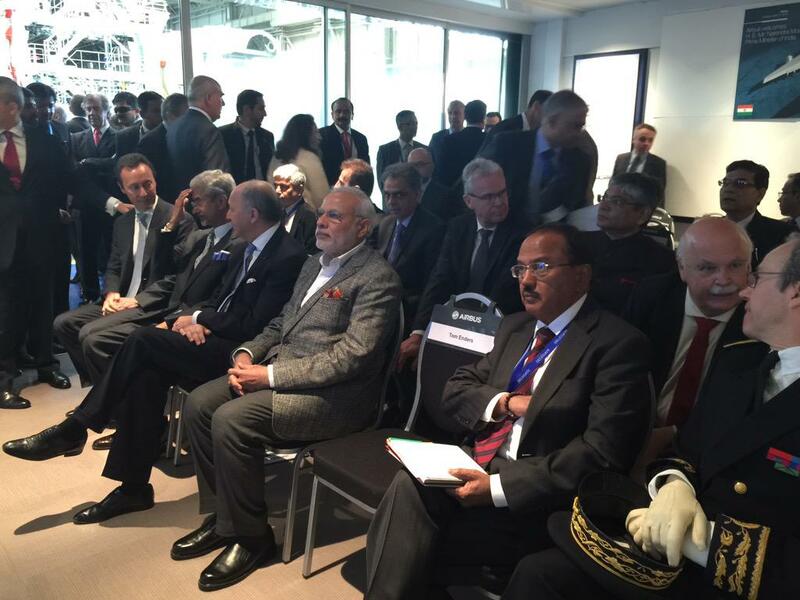 Glimpses from Modi's ceremonial welcome in Paris.